The Happy Time Murders takes place in a world where muppets and humans live together but not in perfect harmony. Muppets are treated as second class citizens and are subject to a lot of discrimination. 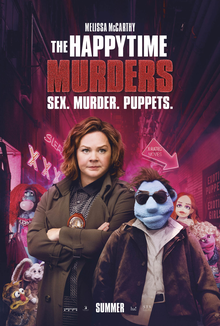 The main characters muppet Phil Phillips (puppeteered by Bill Barretta) and Connie Edwards (Melissa McCarthy) used to be partners on the police force till Phil made a terrible mistake which caused him to loose his job and his partner Connie ended in the hospital. Years later this tragedy comes back to haunt Phil and the cast of HappyTime Gang - a popular television series in this world where most of the actors were muppets. Phil must figure out who is killing all the members of the Happytime Gang before his brother, Larry Shenanigans Phillips, a member of the cast get's murdered too. It is a fun film with a lot of adult humor and situations, so do not bring children to this movie. I would definitely recommend this movie if you're looking for a laugh.